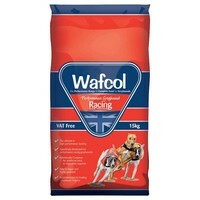 Wafcol Performance Greyhound Racing Dry Dog Food is a complete food designed specifically to meet the nutritional requirements of performance racing greyhounds. Developed especially for the unique physiology of the greyhound breed, the food is the ultimate in high performance feeding; containing the optimum levels of protein, energy, vitamins and minerals required by dogs racing at the highest level. The blend of oils, minerals and vitamins in the food also ensures that your dog stays in peak physical condition both inside and out. Specifically developed for the unique physiology of the greyhound breed. Made with an extremely palatable and easily digestible formula. Includes extra glucose for increased energy levels. Contains a balanced level of calcium to strengthen teeth and bones.